This year’s championship took place in Monmouth. Inglefield House in Monmouth was as usual the comfortable venue for the girls’ championships. Kevin Thomas had done his customary sterling work in ensuring a good number of players from the school, with an overall total of 40 entries, only one failing to make it on the day. This year he was rewarded with a new star Xanthe Harris, who was winner of the U9 championship with 5/5. The U8s’ was won convincingly by the top seed Ashika Shahameeran with 5/5. 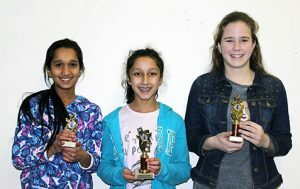 Maybe even at this age, the players are quite canny, as by agreeing a draw in the last round, Suhaani Prasad and Lara Omidvar ensured they took home trophies for second place on 3.5 points. As mentioned above, Xanthe Harris took the U9 championship with 5/5. 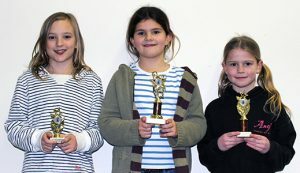 Her triumph was ensured by a last round win against Fay Russell who outrated her by a long way at the start of the tournament. Daisy Phillips did very well to pick up the 3rd place trophy in her first event. The U10s finished almost in rating order. The top two seeds Hiya Ray and Anna Boyle had to meet in round 4 with Hiya winning quite quickly. Joana Anjos reached 3 out of 4 and gave Hiya a good game in round 5 but the stronger player won in the end, with Joana no doubt quite pleased to take home the 3rd place trophy. 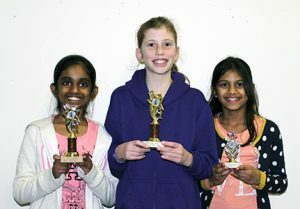 There was little to split the top two on rating in the U11s and Nayana Kalavala and Madeleine Smith had both recently played in the World Youth championships in Greece. Madeleine was the one to come out on top in their 4th round encounter and she completed the tournament with a win and yet another champion reaching 5/5. Bindu Doddi was 3rd with 3 points. 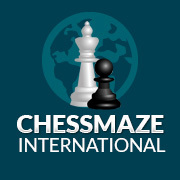 Playing two age groups together in a Swiss tournament is never satisfactory, as the younger age group’s results canbe seriously affected by how many of the older (and usually stronger players) each player has to play. It was also unfortunate that with only 9 players there had to be a bye in each round, which by the last two rounds will have to come from the better players. Rachel McIntosh was the beneficiary. Inexperience meant that after a pleasing draw with Aishwarya Lutchman Singh in round 1, Rachel achieved a probably drawn ending against Neya Govindaraj in round 2 with a B+P for a R, but played too slowly and despite the increments lost on time. This lead later on to her picking up the bye point in round 4; but taking advantage of this, she won her last round game to come a creditable 2nd in the U14s. The crucial game for the combined tournament came in round 3. Emily Wang (U14) had played very well to reach a winning late middle game with 2 Rs against Susanna Fraser’s (U12) R+N. Unfortunately Emily walked into a mating net, partly of her own making, and it was Susanna who came away with the full point. Susanna then beat Neya in round 4 to get to 4/4 and already clear winner of the U12s. 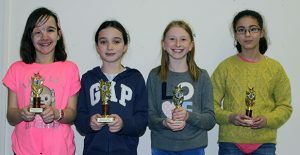 To ease the ‘bye problem’ I gave Susanna the bye in round 5, and with other results of U12s v U14s going to the older players, I think the joint 2nd for the U12s Evie Hurn, Beth Bradfield and Asha Sparks was probably about right. In the last round Aishwarya beat Emily to win the U14s with Neya making up the trophy winners in 3rd place. My thanks to Kevin Thomas for his help on the day and for organising the venue, and to parents for getting their children to the event and to a number of these who helped set up before and pack away afterwards which makes the organisers job a lot easier. The girls’ behaviour during the games was very good and I hope many of them will continue to take part in junior events, where all players will now have a rapidplay rating to carry forward. 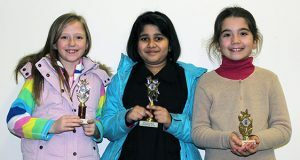 U8: Ashika Shahameeran 5; Suhaani Prasad, Lara Omidvar 3.5; Isabella Caesar, Jess Stentiford; Sophie Williams Anika Kamath; Samantha Holley; Eloise Walker, Verity Ainsworth; Elin Pickett, Lydia Picton-Trivett. U12/14: Susanna Fraser 5 (U12 champion); Aishwarya Lutchmas Singh 4 (U14 champion); Rachel McIntosh 3.5; Neya Govindaraj 3; Emily Wang, Beth Bradfield, Evie Hurn, Asha Sparks, Anna Shellard.